Emails on an old Sober Look post discussing EUR LIBOR vs. Euribor indices continue to come in, with readers offering their explanations for the divergence between the two. As the chart below shows, the 3m Euribor to LIBOR spread is still elevated, now at about 7bp (7.7bp was an all-time high). Besides a slight difference in the calculation, the best explanation continues to be the differences between the two “panel banks” that provide their quotes for the calculation. 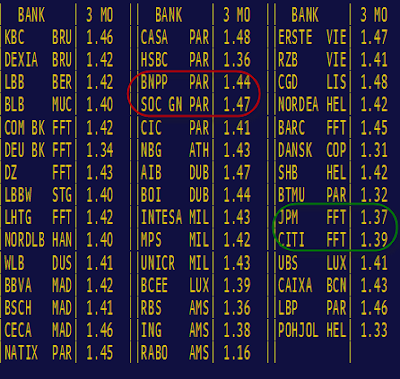 The Euribor panel includes a large number of eurozone banks. The panel has for example 6 French banks, 4 banks from Spain, and 3 from Italy. It is generally believed that the eurozone banks would quote higher levels, since their increased funding needs will prompt them to pay higher rates. There is some evidence for that difference in the daily rate contributions. The EUR LIBOR panel on the other hand is much smaller and has a higher percentage of US, UK, Swiss, and Japanese banks that may not have the same funding concerns and would therefore quote lower rates. At least that’s the theory behind this persistent spread. Sadly, the reality has little to do with what many eurozone banks are actually quoting. Almost no material transactions have been done in term unsecured loans (which is what Euribor represents) for some time. The bulk of term interbank lending in the Eurozone is done on a secured basis, using repo. 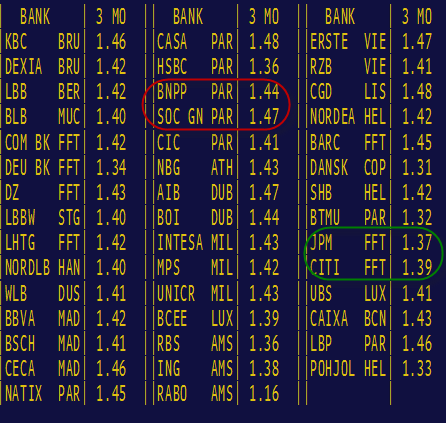 The European Banking Federation (EBF) has coined a name for the index that represents secured funding in euros. It is called the "Eurepo" and is calculated in a fashion similar to what's done for Euribor, using a panel of banks. Unlike Euribor however, which unfortunately is used to settle trillions of swaps and calculate interest on corporate loans, Eurepo actually represents a relatively active market in secured (collateralized) lending. … the recent European crisis has now nearly completely vaporised what little unsecured interbank lending was left in the market. What’s more, the demand for tri-party transactions — where collateral is managed by a custodian rather than bilaterally — has almost doubled from less than 25 per cent before the Lehman crisis to almost 50 per cent since. 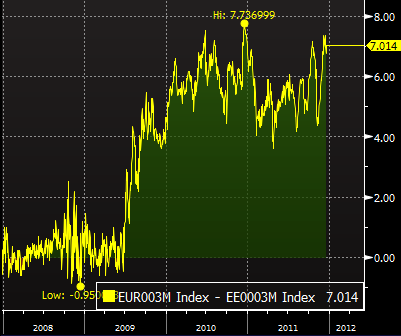 As the chart below shows, the Eurepo rates have been collapsing as the eurozone economies slow. 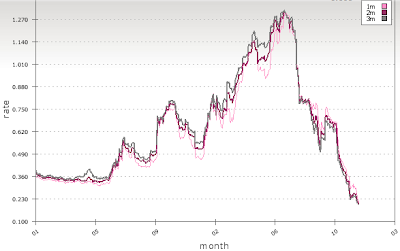 This is what one would expect to happen to rates in this part of the economic cycle in the eurozone. 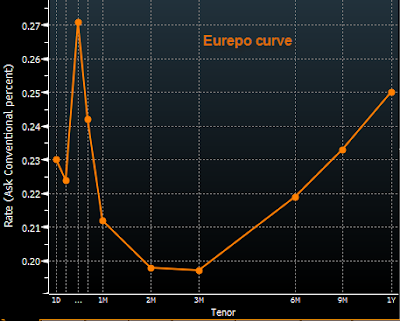 The following chart shows the Eurepo yield curve. The spike at the 2-week point represents some premium for lending over the year-end as institutions do some "window dressing". Again, this shows an actual supply/demand component of the market. Going forward for any economists or risk managers who wish to look at true nominal short-term interest rates in the eurozone, Eurepo is the most representative index. On the other hand both Euribor or EUR LIBOR do not represent any actual market and therefore have little economic value or meaning. Hopefully in the long term any instruments that currently use Euribor for settlement or rate calculations will shift to Eurepo.